The flexible electrodes are the essential components for fabricating modern flexible supercapacitors. 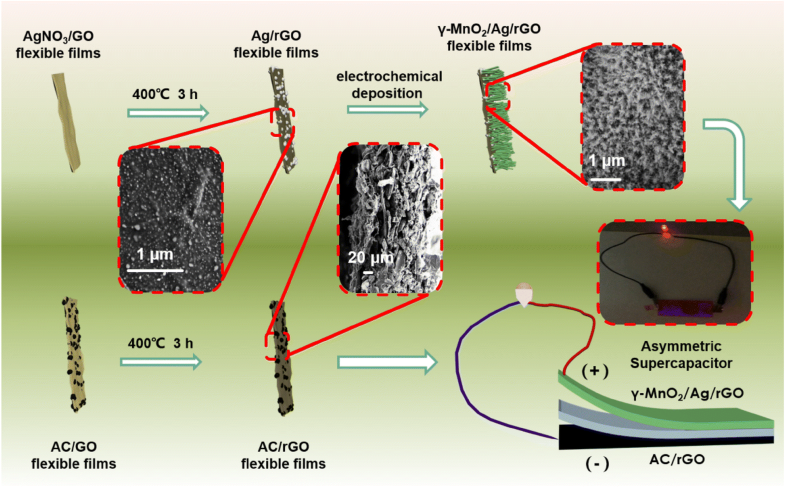 In this study, a composite hybrid film integrated with silver nanoparticles (Ag NPs), reduced graphene oxide (rGO) and γ-MnO2 nanorods as a flexible electrode has been developed by the electrochemical deposition method. The substrate (rGO) of the electrode not only provides mechanical stability but also ensures fast electron transfer during charge–discharge. The Ag NPs distributed in electrode provide the electronic channel to enhance the electric conductivity. 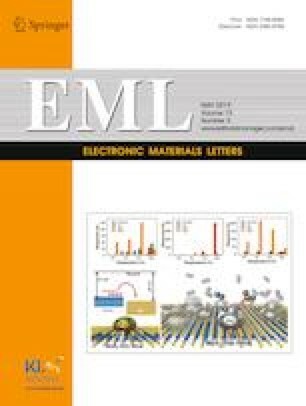 The γ-MnO2 electroplated on the surface of hybrid films further improved the electrochemical performance of them. The resultant γ-MnO2/Ag/rGO hybrid films exhibit a high specific capacitance of 1090.3 F g−1 at current density of 0.3 A g−1. The asymmetric supercapacitor (ASC) devices were further fabricated by γ-MnO2/Ag/rGO films as anode and AC/rGO films as cathode electrodes within a wide operating voltage of 0–1.7 V. The energy density of obtained ASC devices was 71.8 Wh kg−1 at a power density of 279.4 W kg−1. Shiqing Sun and Yongkun Liu are equally contributed equally to this work. The online version of this article ( https://doi.org/10.1007/s13391-019-00132-z) contains supplementary material, which is available to authorized users. This work was financially supported by Collaborative Innovation Center for Modern Textile Technology of Zhejiang Province (2011-Program) (20160202) and “521 Talents Training Plan” in Zhejiang Sci-Tech University.